2018 Emmy Nominations by the Numbers: Plus, Which Star Is on EGOT Watch Now? Let the road to the 2018 Emmysofficially begin! Thursday morning, Hollywood awoke to the sweet sound of nominations being read for this year's annual award show. 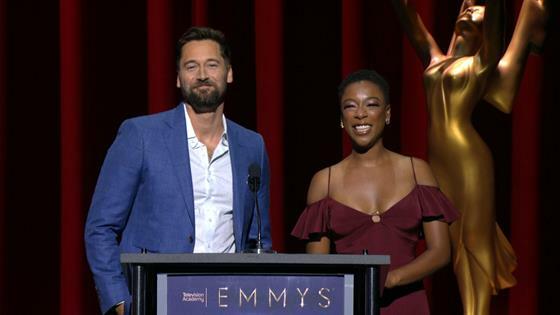 The Blacklist's Ryan Eggold and The Handmaid's Tale's Samira Wiley had the honor of announcing this year's nominee pool and they did not disappoint as they listed off the year's contenders one by one. There was also an added bonus for Wiley—she landed her second Emmy nomination for Guest Actress in a Drama Series for her Hulu series. However, that wasn't the only highlight. Among the dozens of nominations this year, there were plenty of standout nods, including more than two dozen stars who earned their first Emmy recognition as performers. Sandra Oh became the first Asian woman to be nominated for Outstanding Lead Actress in a Drama Series when she was honored for her work on BBC America's Killing Eve this year. Meanwhile, Anthony Bourdain, who tragically passed away in early June, was posthumously nominated for his work on Anthony Bourdain: Parts Unknown. One show set its own new record while some actors and actresses were honored in multiple categories this year. As for one musician in particular, he's incredibly close to becoming a rare and highly respected EGOT winner. Without further ado, let's break down the numbers of this year's Emmy nominations. This year, 36 stars were welcomed into the Emmy performing pool for the first time, including The Sinner's Jessica Biel and Insecure's Issa Rae. Oscar winner Penélope Cruz also landed her first Emmy nod for The Assassination of Gianni Versace: American Crime Story as did longtime singers Sara Bareillesand Ricky Martin. It's quite a feat to nab one nomination, let alone two, three or four. Still, seven stars were recognized in multiple categories this year, including Atlanta creator and actor Donald Gloverand Barry actor Bill Hader, both of whom were honored with four nominations a piece. An Emmy nomination is incredible on its own, but when you combine it with a Tony, Oscar and Grammy, you get the unicorn of Hollywood: an EGOT. John Legendcame one step closer to joining the short list of fellow EGOT winners when he was nominated for an Emmy Award for the first time this year for his performance in NBC's Jesus Christ Superstar Live in Concert. All that's left to do is take home the statue in September and his set of awards will be complete. Saturday Night Live broke its own record this year when it was nominated for 21 nominations, bringing its total tally of nominations ever to 252. The show set a new record last year when it collected 22 nominations. Meanwhile, SNL creator Lorne Michaels remains the most Emmy-nominated individual in history with 82 nods. Game of Thrones is definitely coming this Emmy award season. With 22 nods, the HBO hit series is the most nominated program this year, outranking SNL, Westworld and The Handmaid's Tale. We'll have to wait and see if the show beats its own previous record of most wins by a series in a single season in 2015 and 2016 with 12. With its 22 new nods this year, Game of Thrones has officially become the most Emmy-nominated drama in history, outranking ER's 124. Be sure to catch the 2018 Emmys live on NBC on Monday, September 17 at 8 p.m. ET.